A Military Liaison Officer of the UN Mission for the Referendum in Western Sahara (MINURSO), looks through binoculars during a ceasefire monitoring patrol in Oum Dreyga, Western Sahara (June 2010). Western Sahara is located on the north-west coast of Africa bordered by Morocco, Mauritania and Algeria. The colonial administration of Western Sahara by Spain ended in 1976. Fighting later broke out between Morocco and the Polisario Front. A ceasefire was signed in September 1991. 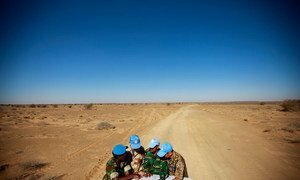 The UN mission, known by its French acronym, MINURSO, was deployed that year to oversee a ceasefire and a UN settlement plan; however, disagreements between the Government of Morocco and the Polisario Front prevented the holding of the anticipated referendum on the territory’s future. A revised settlement plan proposed by the United Nations after seven years of diplomatic consultations was rejected by one of the parties in 2004. In renewing the mandate of MINURSO, by a vote of 12 in favour to none against, with China, Ethiopia and Russia abstaining, the Council called on parties to resume negotiations under the auspices of the Secretary‑General without preconditions and in good faith.